Christmas buttons are 50% off at work this week so I snapped up a packet of these ‘Christmas lights’ and made some earrings to wear to work the next couple of days with my hot pink Santa hat! And Christmas just isn’t Christmas without gingerbread people. A home day today in which I did eleventy-bajillion loads of laundry, vacuumed, cleaned bathrooms and the kitchen, baked bread and the aforementioned cookies. Wishing you all a Cool Yule, Merry Christmas, Super Solstice, Happy Hannukah or just a nice end to 2016. Adult colouring books have really taken off, it seems. I hear lots of people talking about it now, and books are for sale all over the place. In August, a friend gave me a set of Faber Castell PITT artist pens (brush) in the basic primaries and secondaries. Specifically, Pink Carmine, Phthalo Blue, Purple Violet, Permanent Green Olive, Cadmium Yellow and Dark Chrome Yellow. Today I had to go downtown for a quick dental checkup to make sure that some cold sensitivity wasn’t a cavity (Phew! Nothing found!) so I also dropped in at a lovely little tea shop for a Cowboy Fog (I believe it has tea and coffee beans in it) with Tai Chi Man, and a nearby art supplies shop which sells these pens. Their stock seemed a little low, but I added Black, Caput Mortuum (looks like brown to me), Cobalt Green, Light Green and Medium Flesh. Well, this is exciting. I updated my iOS today on the iPad Mini, AND noticed a WordPress update in the App Store. So I felt lucky enough to try a post in the app (I’ve been using Safari for months because of crashing problems). And yippee, the photos uploaded. 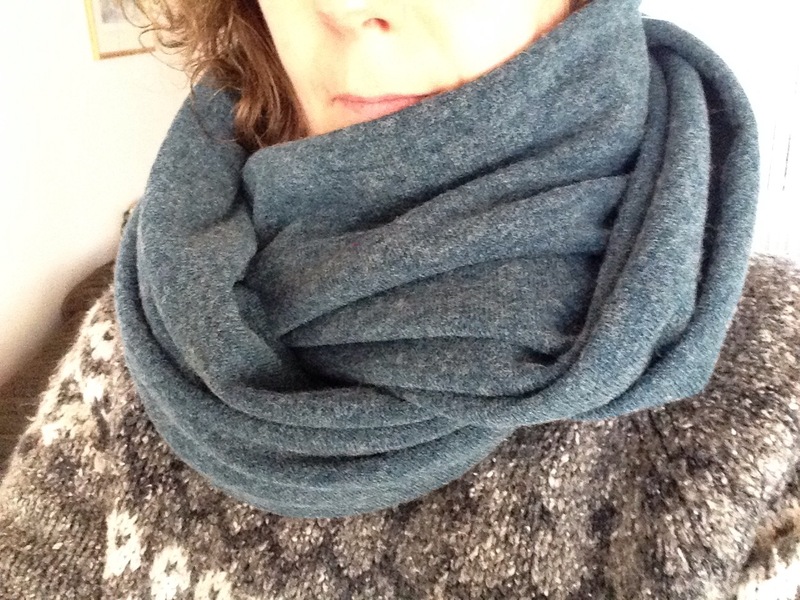 I had some much needed home time today and finally spent enough time in my sewing room to get the ironing done, sew three infinity scarves and make a no-sew vest. A pretty remnant I brought home from work. 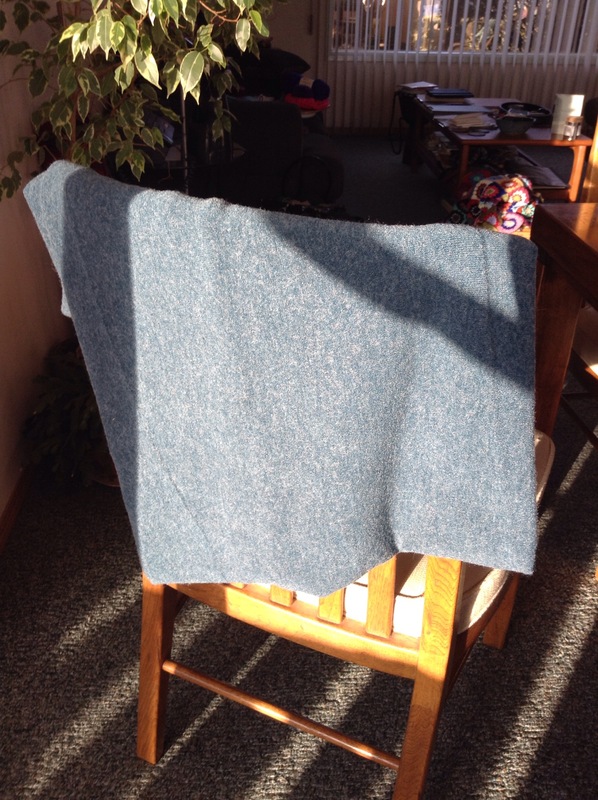 The above fabric is a lovely soft greyed blue. 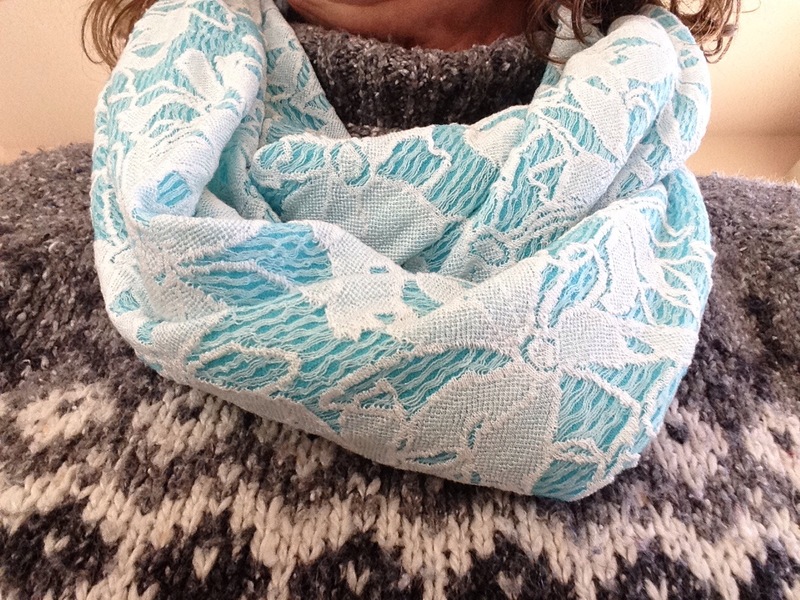 It’s like knitted sweater fabric, and so soft. This piece was 150cm wide and about 90cm long. 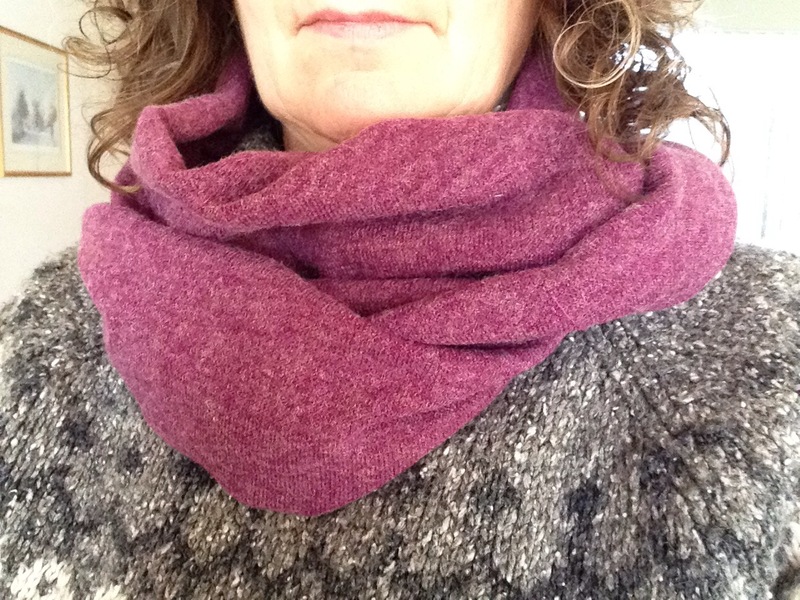 The result is wide enough to wear over the head as well as around the neck. The pink version is also from a piece of fabric 150cm wide (which becomes the length of the loop) but only 45cm long, so it’s skinnier than the blue one. The no-sew vest is made from identically-patterned fabric to the other one that I made, but in a pink rather than a turquoise colourway. I had to mess about to get the photos to display, and they are at the top of this post and it’s too much effort to move them! 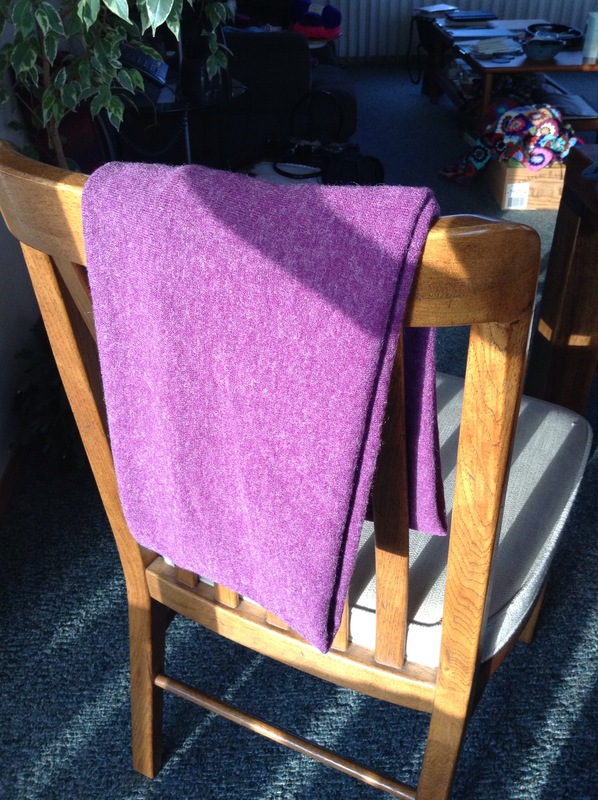 It is hung up with a black turtleneck underneath. 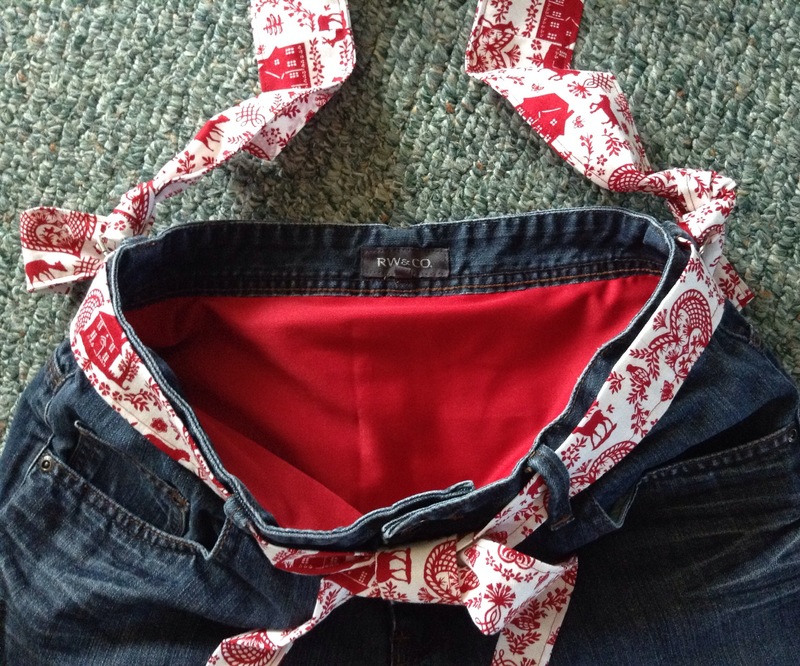 I’ve had customers admire my first one at the store, wanting to know how it’s made. (Dead easy!) In fact, this one was even less work than the last, as the colour went all the way into the selvedges and I didn’t have to trim them off. 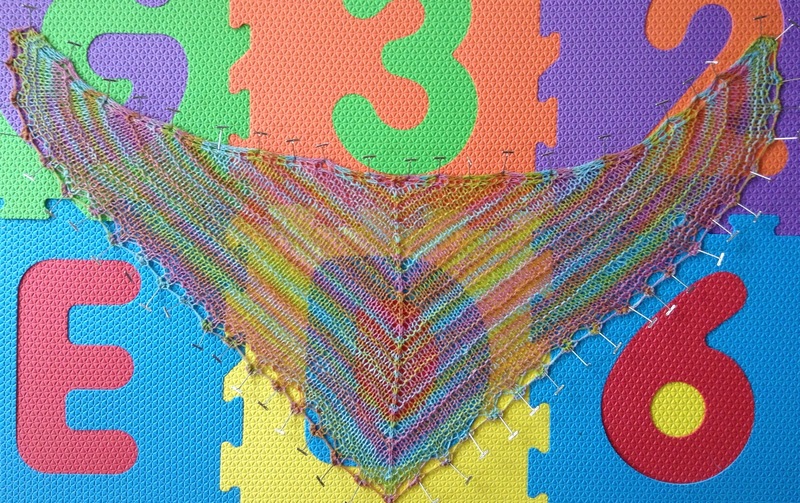 My kerchief is finally being blocked. It joined a load of clothes in the washer and is now being streeeeetched on the mats. And the legs are destined to become yoga mat bags. One leg already has fabric added to the top and bottom, but I need to get some sort of cord for the carrying handle and think up a cute embellishment. I’m doing a different event in a couple of weeks which I am optimistic about. It’ll be a new audience who will hopefully like what I make. 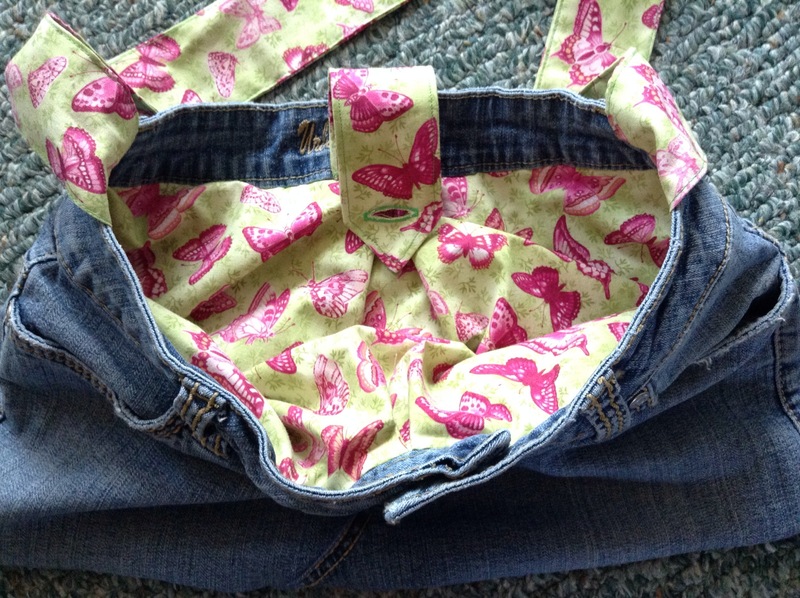 Inspired by Pinterest, I have upcycled a pair of jeans that recently died. It was a tricky place for them to wear out though, right at the top of the inner thigh. I cut up the inside leg seams and found that, of course, when I wanted to overlap the curved seams over each other, preferably with the topstitching showing, the worn out bit was on the side I wanted on the outside. So I had to overlap it the other way, which doesn’t look quite as good. 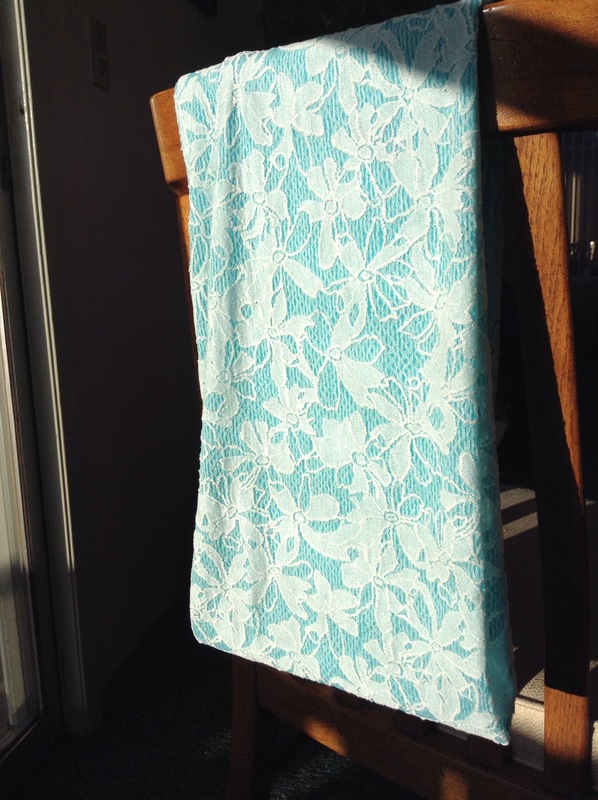 Anyhow, I had two panels of rather pretty daisy fabric which I put behind the V shaped gaps and pinned in. 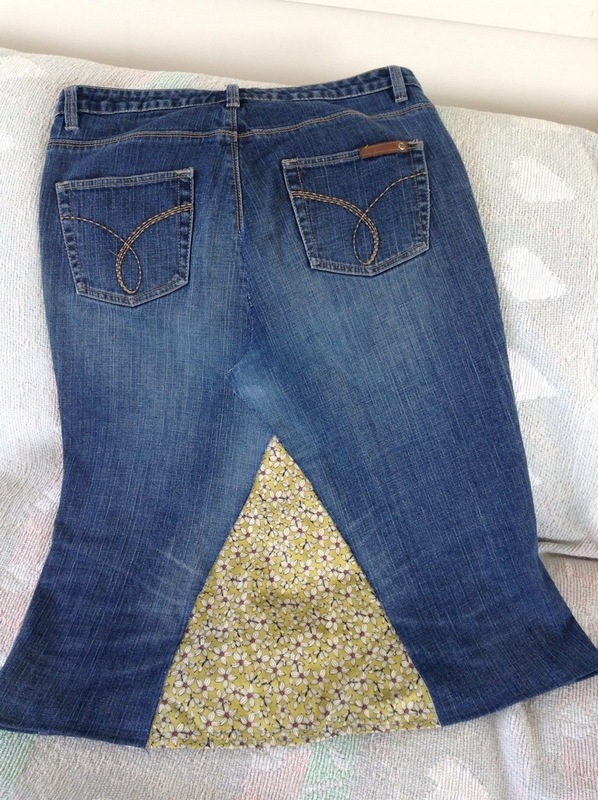 Tried it on, repinned again, when I was happy with it, I sewed it in, just topstitching twice near the edges of the denim. The only place I zigzagged was at the top of the back V, where the edges were raw and will get more wear. 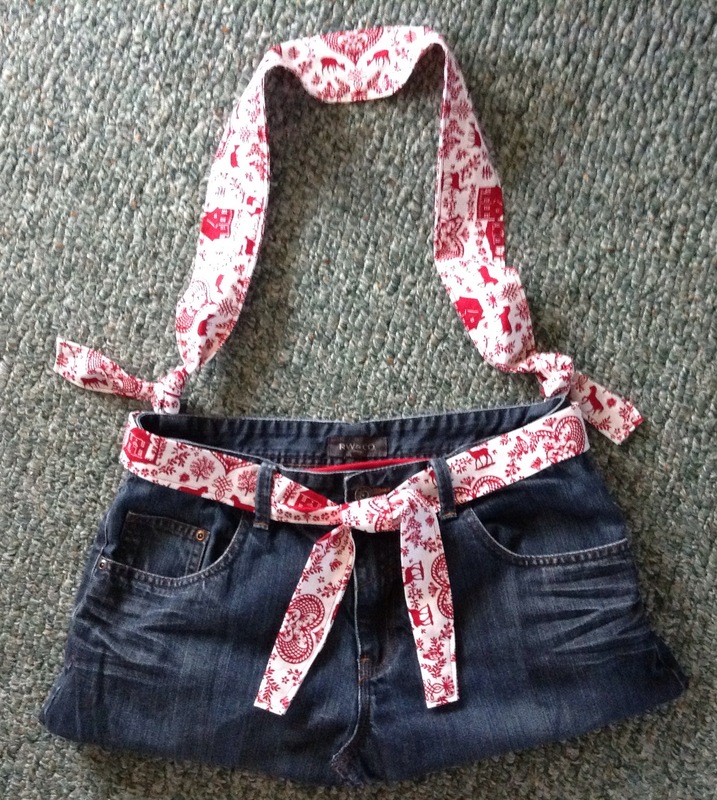 Any frayed bits will add to its charm! Tai Chi Man set a line of pins around the hem for me (with a metre stick, while I stood on a stool) and I machined that, and it was done. 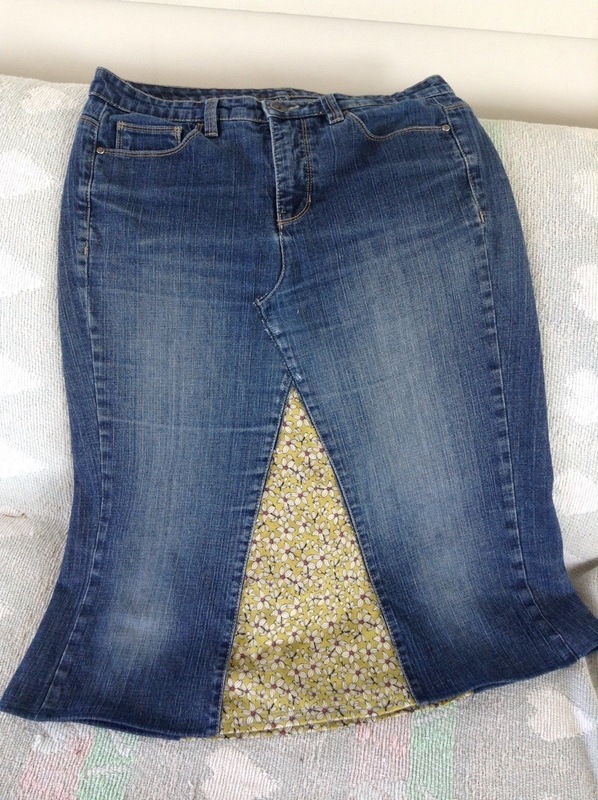 If you’re looking for a tutorial I’m sure there are many online, but there is an exceptionally good one in the book Jean Therapy by Scatha G Allison (I borrowed it from the library). 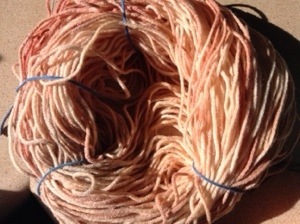 This is the result of my dyeing acrylic experiment that I told you about last week. 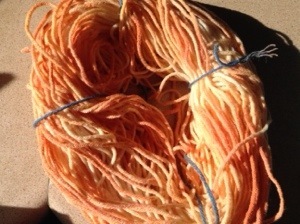 The skeins took a long time to dry out, then I had to wash and rinse them and hang them to dry again. A lot of paint came out. 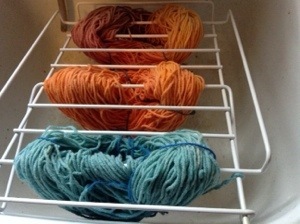 The turquoise and orange ones have a deeper colour than the one on which I tried four different separate colours. 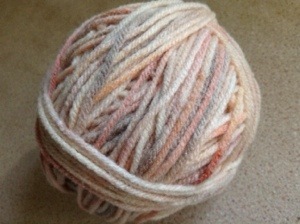 The yarn was cheap and not soft to start with, and whilst it feels a little stiffer in places, it is knittable. I don’t think I would trust this not to run with later washing so I wouldn’t combine two skeins in one project, just in case. Now to wind it into balls. Edited to add photos of wound balls…turqoise 75grams, orange 105, and Neapolitan 80. 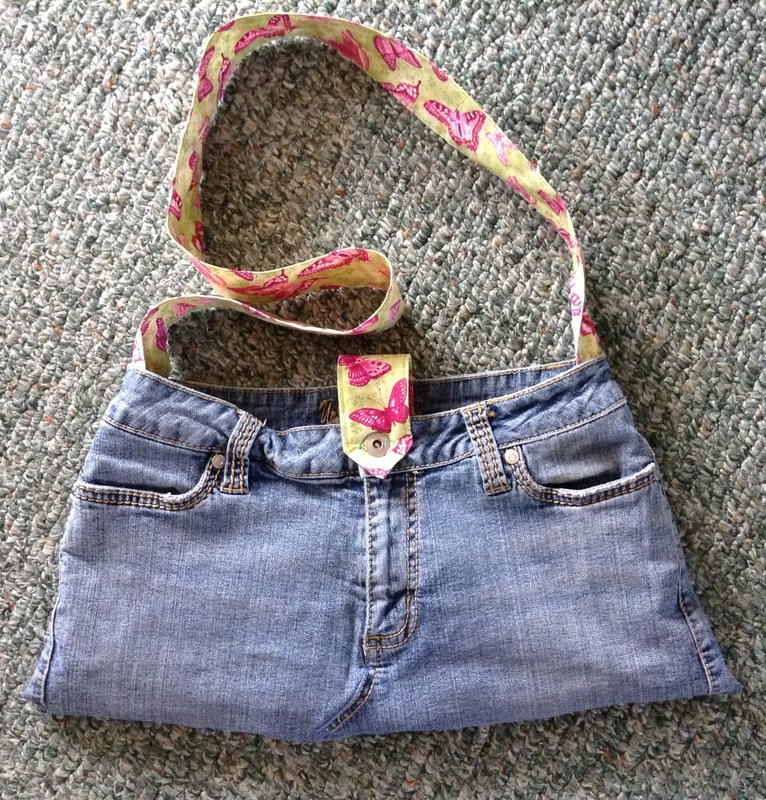 The above link will take you to a video by the Frugal Crafter. 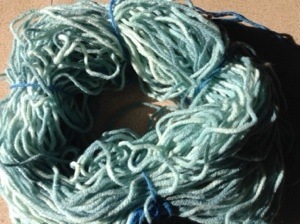 This lady had the brainwave that she might be able to dye acrylic yarn with acrylic paint. And guess what…you can. It’s more like handpainting really, because the fibre is not actually absorbing the paint, but it seems to work. I had to try it. 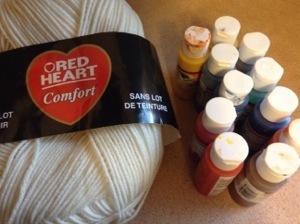 So armed with a one pound ball of Red Heart Comfort (cream, from Walmart), I played the video again while winding off some yarn into hanks and getting out my old acrylic paints, which the kids haven’t used in years. 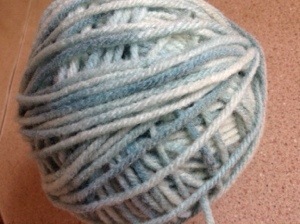 The first one, I used two greens and a blue, and they mostly mixed to form a pleasant uniform blue-green. The second was yellow and orange. The third, I got more creative, and used red, yellow, orange and brown in four quadrants, allowing them to blend where they touched but still keep them as individual colours. I think I succeeded and will know better when it’s dry. I’ve left them to drip dry over my laundry tub and they’ll probably take a couple of days. 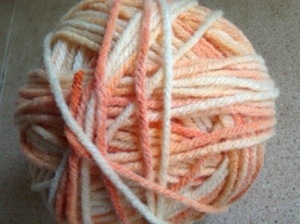 I only used about half the ball so once I see the results and how the yarn feels I will know whether to dye the rest.